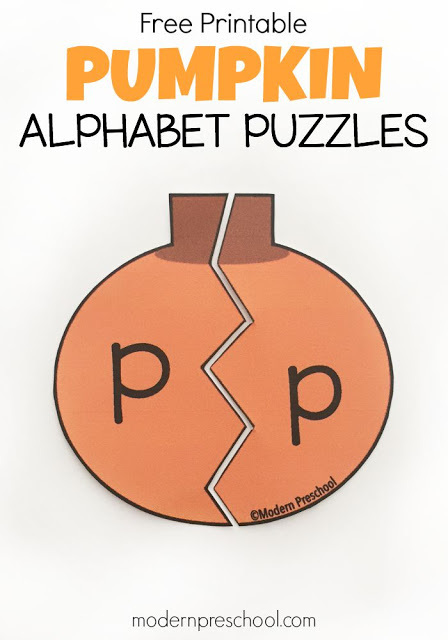 Practicing letter matching will be so fun with this set of free printable pumpkin puzzles! 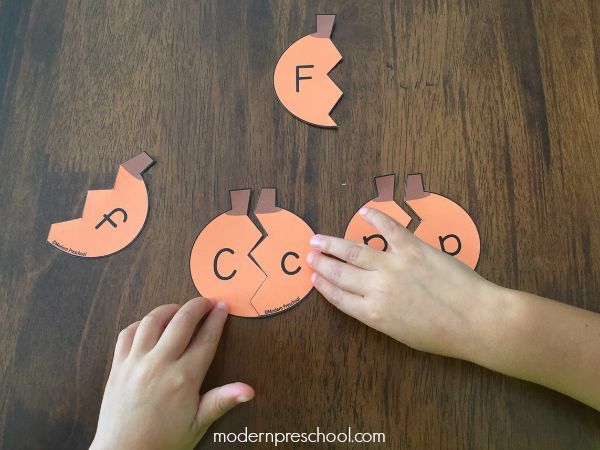 Preschoolers and kindergarteners can sharpen their upper and lower case recognition skills while putting together broken pumpkins. Busy bags at home (or table top learning centers at school) can be used while older siblings are doing homework or during a quiet time during the day. 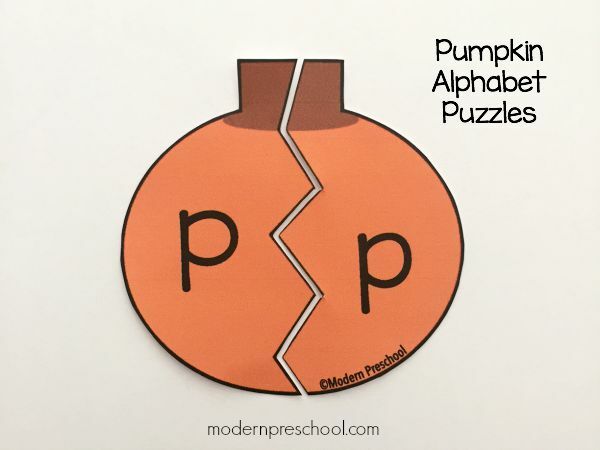 The great thing about printable activities like the pumpkin alphabet puzzles is that they can be adapted for younger and older learners! 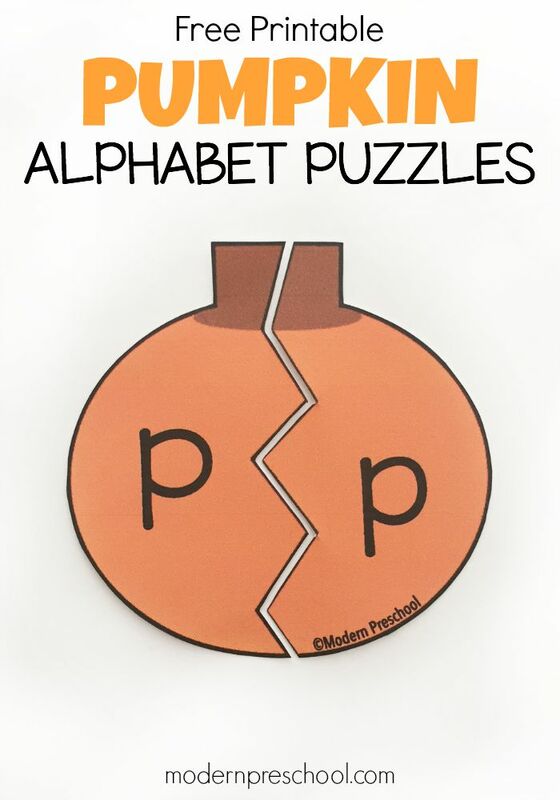 The set of puzzles includes 26 “broken” pumpkins. Each pumpkin consists of one upper and lower case letter. Print the pumpkins out on cardstock. I recommend laminating BEFORE cutting the pumpkins out. (We use this laminator at home all the time!) This makes sure the puzzles pieces fit together perfectly and reinforces the paper pumpkins. Cut each pumpkin out and then cut down the zig-zag line. Mix up the pumpkin puzzle pieces. Now it’s time to play! The goal is to match each upper case pumpkin piece together with the correct lower case pumpkin piece! Because there are 26 pumpkins (52 pieces!) it may be overwhelming for younger learners to begin with all of the pieces. Choose only 3-5 pumpkins for your child to practice matching. As the matching gets easier, add more pumpkins into the game. This will help build confidence with less frustration. It will also allow the busy bag to become and independent activity! For younger learners who are do not know all of their letters yet, print out 2 copies from the attached file. Cut out only one set of pumpkins! 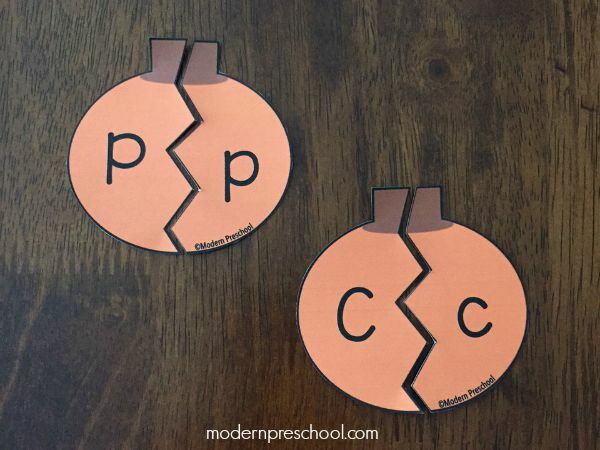 Show your child how to match the letters on the pumpkins that have been cut apart to the second set that have not been cut apart. Talk about the letters and the sounds that the letters make. Add even more of a challenge after your child has mastered matching all 26 pumpkins! Create a concentration memory game! For older kids who are up to even more of a challenge, print out the pumpkins and cut them apart. Back the upper case letter sides of the pumpkins with one color of paper. Back the lower case letter sides of the pumpkins with another color of paper. Turn all the pieces over so the letters are facing down on a table. Each player picks one upper and one lower case piece to try to make a correct match. If the player makes a match, go again! This is a great way to involve other family members! Low prep printable activities make life easier at home and in the classroom! Check out our collection of preschool printables! Looking for more fall themed ideas for kids? Check out these fun activities!